Yesterday we did (finally) update the review for the six-way split 6 Ways Of Hell, which was a collaboration done by Russia’s top-label Satanath Records at the one hand, and six bands / projects from the East of Asia at the other: Barzakh (Indonesia), Goresluts (Malaysia), Savage Deity (Thailand), Shadowmirth (Brunei), Suicidal (Singapore), and last but not least, Japanese duo Horrific Disease (Makoto Mizoguchi and Haruhisa Takahata). For the review on that record, done with pain, passion and pleasure by undersigned, please check out the upload of yesterday, December 24th 2015. The tracks from that split were taken from their upcoming album (which this review deals with), as a kind of teaser, I think. 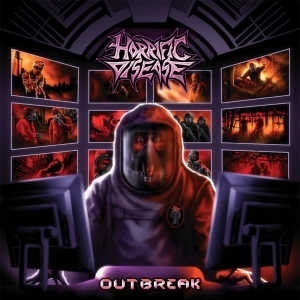 The main parts were written and recorded throughout the past years, but finally they get compiles officially under the banner of Outbreak, eventually being a twelve-track album with a total running time of just over half an hour. And first a word about the sound: grandiose. The mix in between the different aspects has been worked out with attention and punctuality, resulting in a clean yet, at the same time, enormously full and brutal production. Outbreak brings a well-balanced mixture of Crust / Punk at the one hand, and Grind / Death Metal at the other. For the better part all this finds its roots within the scene from two and a half / three decades ago, including the overdose on Horror elements (a limited yet pretty cool injection of haunting synths at the one hand, and terrifying samples at the other; and check out the artwork as well to understand…), quite some energetic grooves (cf. the bass lines, a. o. ), and some subtle Thrash-injections (cf. some raging riffs but especially the throat-cutting solos). But on top of it, you need to pay attention to the sarcasm behind the whole concept. Actually, the humoristic aspects, whether it was meant to be that way or not, are part of the whole experience. And another striking element is the variation, with some pieces rather dwelling within the metalized current, some rather of the grinding kind, and others being deeply punkish in performance (and for the insiders: do I hear some Belgian Asociality in a piece like Slaughter? ).